I’m fascinated with old-fashioned barns that speckle rural America. The architecture, the history, a reflection of the past. I have many memories of our family barn, from playing with my sister, brother and friends (at the top of the list) to daily chores and cleaning (at the bottom of the list). Memories such as witnessing the amazing birth of lambs, puppies and foals; bottle feeding newborn lambs whose mothers wouldn’t let them nurse; luring back escaped horses with buckets of oats; finding small nooks for games of hide-and-seek with friends; the daily hunt to find where the hen Peaches laid her egg; sitting on a 10-gallon bucket after school to talk with your sheep in hopes to tame them in time for the 4-H fair; and the early morning wake-up call from Mr. Roo. 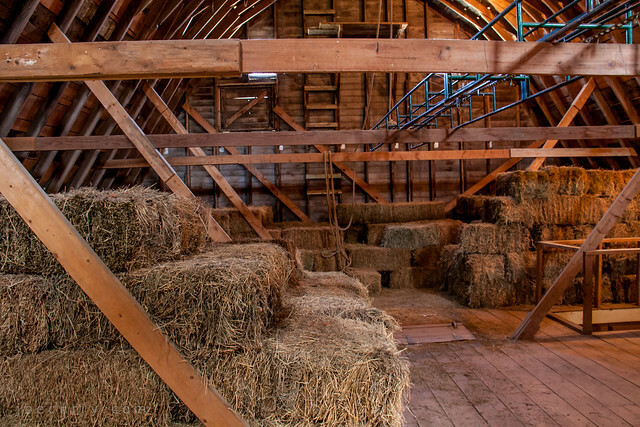 Over the past 30 years, the core frame of our family barn and the hayloft have stayed the same, while the rest has adapted to changing livestock needs and hobbies. This barn is well maintained. Others are not so fortunate. One by one, many historic barns are vanishing. Today, wood framed barns are often replaced by more cost effective metal buildings or pole barns. And with fewer working farms, many barns sit idly on the prairie, and each timber, weathered by time, deteriorates or sags until the building falls in upon itself. of ones that stand tall. The first thing that came to my mind when I saw this photo was the smell of the barn. I do not mean that in a negative way. It’s looks exceptionally clean and well-tended. The smell of the hay, the wood, etc. . . If the image was like a scratch and sniff sticker, I’d do it. Haha, too funny. You’re right…every barn does have a farm smell! Fortunately, we never had hogs, so it’s not an unpleasant one!